SINGAPORE - Frozen yogurt chain llaollao has promised to improve its hiring guidelines after a local woman was allegedly turned away from a job interview because she could not speak Mandarin. Indian undergraduate Karishma Kaur, 22, applied for a part-time role at the company's West Mall branch on Jan 7 but said she was not given an interview as the manager spoke only Mandarin and could not interview her in English. After she posted about the matter on Facebook, the Tripartite Alliance for Fair and Progressive Employment Practices (Tafep) received a complaint about it on Jan 12 and is looking into the issue. Llaollao Singapore's country manager Edwin Ferroa said he has been in talks with Tafep "to look into how we can better the way we employ", and added: "We don't condone such discriminatory behaviour based on race, language or religion." He said that the company had already begun probing the incident on Jan 10 and found that the woman who had spoken with Ms Kaur was the wife of the store's owner who had been helping out. She was not an actual employee. "We will work with Tafep and come up with clearer guidelines for our franchisees' employment practices, such as how they post their job ads and how they communicate to the public who they want to hire," he said. There are 11 llaollao outlets in Singapore. Mr Ferroa said he will meet all franchisees and partners to clarify hiring guidelines. 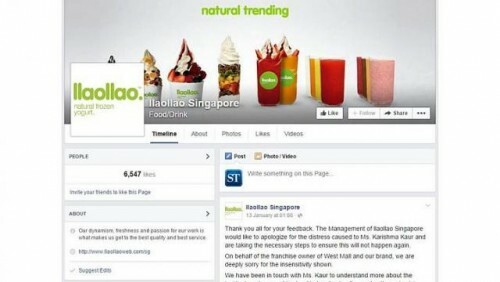 Llaollao Singapore issued a public apology on Facebook on Tuesday and Mr Ferroa wrote to Ms Kaur offering to meet her to clarify matters and improve their relations. Ms Kaur said she accepted the apology and wanted to move on from the incident. She told The Straits Times: "Although we live in a multiracial society and claim that we run businesses based on English as a medium, it does not seem to be the case. "With an influx of foreign talent in Singapore, English as a common language should all the more be embraced to facilitate efficient communication." A Tafep spokesman said the Tripartite Guidelines on Fair Employment Practices state that if a job entails proficiency in a particular language, employers should justify the need for the requirement. He added: "In this case, there was a potential contravention of the Guidelines."